TrustMAPP Converts Information Security Assessment Insights into Action. Information security is the sum total of strong business processes such as incident response, third-party risk, and vulnerability management—up to 40 processes, depending on your industry. Assessments by Secure Digital Solutions (SDS) measure the maturity of your organization's processes. With our proprietary software, TrustMAPP, assessments that once required months can be finished in mere weeks via survey templates. We've pre-built the NIST Cyber Security Framework, ISO27001, and industry-specific regulations (GLBA, HIPAA, PCI DSS, GLBA, FFIEC, FISMA, and SOX) into questions for those on the front lines of your security enterprise. 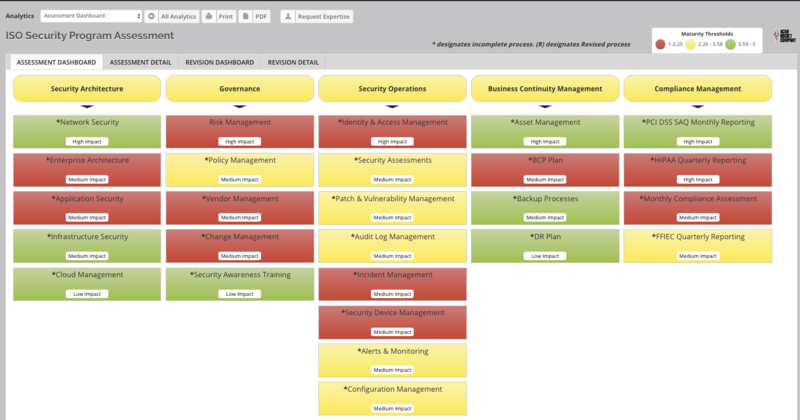 As they respond to predefined security statements, our analytics engine instantly measures each process on six dimensions of maturity in COBIT—awareness, policy and procedures, automation, expertise, accountability, and measurability. SDS delivers assessment results as a clear, high-level profile with underlying detail. We not only point out gaps and threats, we prioritize recommendations based on your business objectives, and offer cost and resource estimates to address them. Our graphic-rich summaries quickly convey security status and progress to those with executive oversight. As remediations are made and entered into our assessment platform, you will be able to visually demonstrate how investments are working. Request an assessment conversation today. Or ask for your free MAPP Guide.